The technique for total rehabilitation of the edentulous, known as the All-on-4 treatment concept, is a surgical and prosthetic medical procedure. The concept was developed, institutionalized and systematically analyzed in the 1990s through studies funded by Nobel Biocare in collaboration with a Portuguese dentist Paulo Maló. It consists of the rehabilitation of the edentulous maxilla and mandible with fixed prosthesis by placing four implants in the anterior maxilla, where bone density is higher. 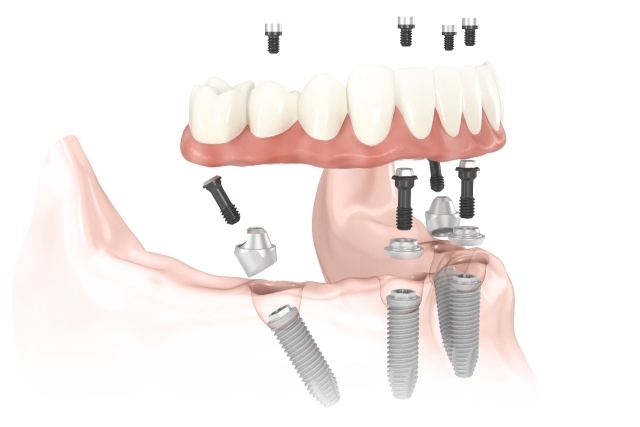 The four implants support a fixed prosthesis with 12 to 14 teeth and it is placed immediately on the day of surgery. All-on-4 is a registered trademark of Nobel Biocare. The All-on-4 treatment concept provides a permanent, screw-retained, same-day replacement for the entire upper and / or lower set of teeth. The procedure is best for patients with significant tooth loss or decay and for people whose bone loss in the jaw area prevents them from getting dental implants. Often, tooth loss is accompanied by loss of the jaw bone which poses the problem of reconstruction of the jaw bone. For the implementation to be successful it is necessary to transplant bone from other parts of the body, for example, the iliac crest or the skull and apply it in the area where it is planned to deploy tooth or teeth. Transplantation of bone graft technique takes between three and six months so that the implants can be placed. After implant placement, it is necessary to wait two to three months, after which time it is possible the placement of the fixed prosthesis.